The term "gamelan" refers to an ensemble of traditional percussion-keyed instruments, including gongs, drums, metallophones, and bamboo flutes from Indonesia. The music is taught by rote and committed directly to memory, allowing for a high degree of interaction between musicians. Our gamelan classes offer students ages 5-adult a unique opportunity to learn about another culture through music. 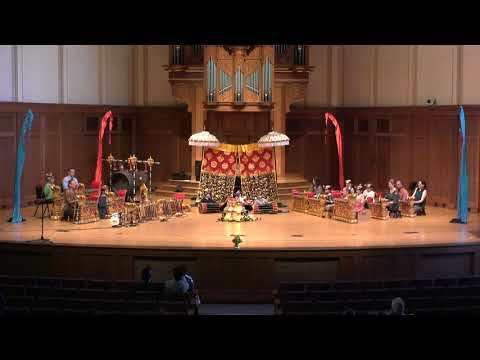 The inter-generational (ages 12-adult) gamelan ensemble meets weekly each semester to explore and experience this unique and fun form of music-making. No musical experience is required. Registration is closed for this session of Community Gamelan. Children aged 5-11 will learn the basics of Balinese percussion music in a positive and cross-cultural environment. Skills emphasized will be rhythmic coordination, memory, and musical and social awareness of fellow students. Director Dewa Ketut Alit Adnyana brings fifteen years of experience teaching children's ensembles. Caregivers are encouraged to stay to assist their children as may be needed. Minimum 5, maximum 20 students. Registration is now open for this session of Children's Gamelan. Click the button below to register. Community Gamelan and Children's Gamelan will perform together in a spring concert. The concert will include meditative traditional ceremonial pieces and vibrant contemporary works by Balinese composers.